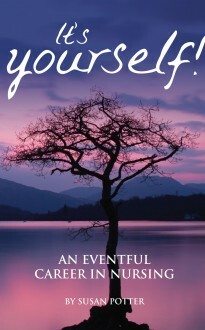 Our self-published books: It's Yourself! Susan Potter knew as a little girl that she wanted to be a children’s nurse. Thirty years later, after working in hospitals in the UK, Germany and the Far East, she crowned an eventful nursing career by founding a hospice for sick children, entirely from her own initiative which, when completed was officially opened by Princess Diana, HRH the Princess of Wales. It’s Yourself! is Susan’s story, from her earliest childhood years divided between holidays in Scotland and her rural home in Essex to the challenges and excitement of an international nursing career. It relates the story of how she trained as young nurse at Great Ormond Street and went on to join Queen Alexandra’s Royal Army Nursing Corps, serving at military hospitals in Germany, Singapore and Hong Kong and rising to the rank of Major. There are chapters about her work with the renowned in-vitro fertilisation pioneers Patrick Steptoe and Robert Edwards at Bourne Hall Fertility Clinic, and her greatest professional achievement – raising the funding and public support necessary to open a new hospice for sick children for the eastern region.